Is what this William Warren cartoon is titled. I would add, Liar, Cheat, Tyrant, Racist, Worst President Ever, and a few others. 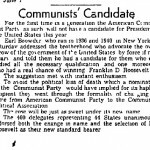 And The Communist Party Pick for 1944?